It's World Thyroid Day today. In my family, many of the elderly ladies are taking medication for Thyroid problem. When my mother was diagnosed with Thyroid, it was very late and taking medicine for life time was the only option left. This is a very common issue with ladies as they couldn't realize that the constant fatigue and mood swings can be the symptoms of Thyroid. 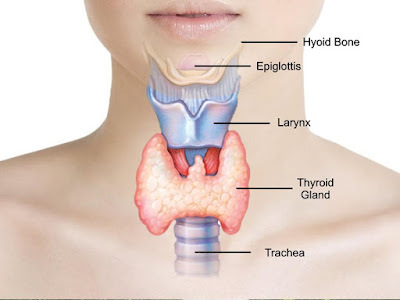 The thyroid gland, located just below the neck in front of larynx, secretes hormones through the bloodstream to every cell and every organ in our body. This tiny, 2-inch gland regulates our body temperature, keeps our brain thinking clearly, our heart pumping fine, and basically maintains harmony among all organs in our body. When one is suffering from Thyroid, this grand becomes either over productive or under productive. If the thyroid gland doesn’t secrete enough hormones into the blood, this is called Hypothyroidism. On the other side, if this grands secretes too many hormones, bodily functions will speed up, as it is hyperthyroidism. The symptoms of both the cases may be different. A simple blood test can easily determine how much thyroid hormone one has in blood. But there could many other reason of tiredness and hair problems so people don't think towards getting Thyroid check and keep struggling with it. Gender: 80 percent of all thyroid cases are found in Women. Age: Incidence of hypothyroidism is higher in menopausal women than in very young women.